How long does it take to make a game? If you’re Keiji Inafune, 18 months it seems. Following on from the astronomically successful Kickstarter campaign, ‘Mighty Number 9’ his spiritual successor to ‘Mega Man’ has been funded and production is in full swing. 3 months have passed. The community managers have been hired; they have set up forums and have started recording podcasts to drum up enthusiasm for the already well publicised project. Behind the scenes, character designers are working on art assets and enemy boss designs, while Inafune himself is writing the story and conducting endless interviews, reiterating that despite the apparent similarities, this game is in no way a ‘Mega Man’ game (no doubt fearing Capcom’s mighty legal hammer). For public consumption after the 12 week of development is a short 60 second ‘proof of concept video’. In it Beck, the blue armour clad hero (who in no way is a stand in for a very similar looking ‘blue bomber’) runs from left to right, jumps and shoots a few things from an arm cannon that in no way can be called a ‘mega buster’. For the community it’s an exciting thing to see. Appetites are whet for what the eventual game will look like in 15 months time. I’m not really a fan of editing posts as I like to think they represent a snapshot of an industry that’s always in a state of flux. However, time has made the opening paragraph of this post even more pertinent. Since writing this post in 2014 ‘Mighty No 9’ became infamous. It was an oversold mess of broken promises and shattered dreams. It was career suiside for Inafune, who proved he could design games but couldn’t manage teams. The game was crowdfunded to the tune of nearly $4 million in 2013, making it one of the most successful Kickstarter campaigns ever. However, ‘Mighty No 9’ was mediocre at best. It was delayed by over a year and a half, and never actually saw the light of day on portable consoles (despite releases on these platforms being initially promised). In total it was in development for over three years before finally being released to a lacklustre response in May 2016. In 2014, Inafune could create a glossy proof of concept video after three months of work. However, two decades earlier he was expected to be somewhat faster when creating games. In 1995, Inafune was lead character designer on a project that went from inception to completion within the same amount of time. “Due to bad timing of certain things coming together at the time, we basically had 3 months to make ‘[Mega Man] 7’. The team leader and about 15 programmers were basically sealed away in a tiny room”, he recalls. Working in a fractured way was the only way ‘Mega Man 7’ was going to meet delivery deadline, though it was acknowledged by all to be less than ideal. Game director Yoshihisa Tsuda remembers that “people from the character division would swap out constantly, bringing in fresh data as it became available, which was then just handed over to whoever was closest to finishing whatever they were working on at the time”. Evidently it was a ruthless, near impossible schedule that lead to the near breakdown of several employees but it also lead to the creation of a true sequel to the original Nes games, as opposed to the next in the Super Nintendo’s ‘Mega Man X’ series. Knowing its history it’s hard to shake the continual thought that even with best intentions, corners were cut. As Tsuda puts it “there are so many things about this title I have regrets about and even at the time we found ourselves wishing for another month or so to work on it”. You can’t help but wonder if the game is reflective of the earlier prequels in tribute or because it was quicker to make the game by repeating what they had literally made before. 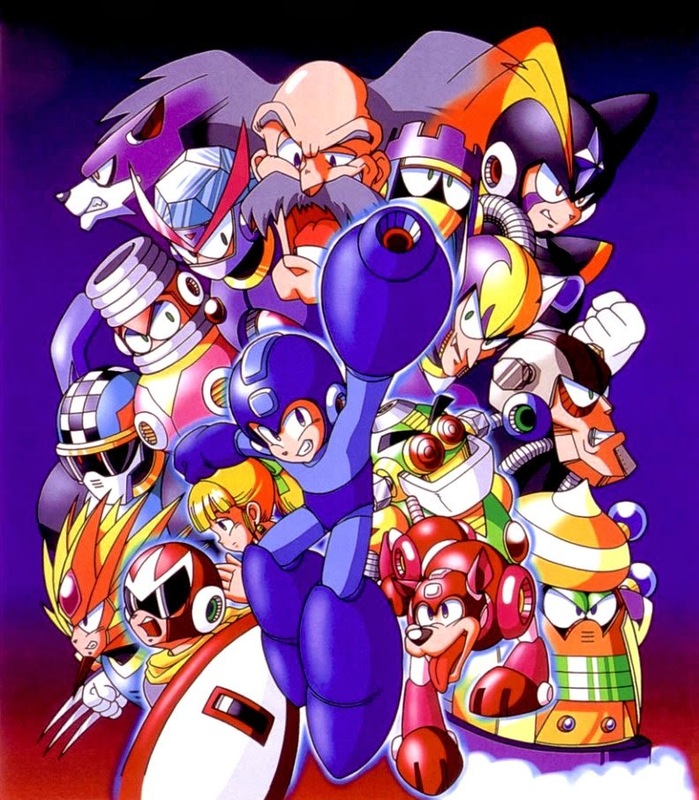 According to artist Hayato Kaji, anyone who was available was drafted in to create the game; “we even had people from the ‘[Mega Man] 2’ team come back”. Unsurprisingly therefore, present and correct are tried and tested elements that define earlier Nes ‘Mega Man’ games. Vanishing block puzzles feature often, there’s an obligatory windy stage and far too many frustrating spiky death traps. 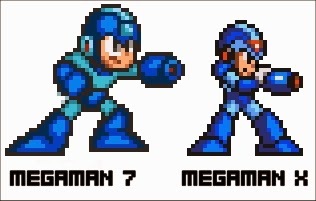 Music seems to have also been lifted from other ‘Mega Man’ games, with the character selection theme taken from ‘Mega Man 5’ However for me, despite following ‘Mega Man 6’ in terms of series chronology, it’s much easier to compare ‘Mega Man 7’ to the very different ‘Mega Man X’ games that exist on the Snes. Playing the game after having previously spent so long with the ‘X series‘ is an odd experience as despite obvious similarities in game genre and character, there are so any nuances that make the two games so different. Though he can run and jump and shoot (in only 2 directions) unlike X, original Mega Man can't cling onto walls, or dash for example. I was surprised at how alien 'Mega Man 7' actually felt when I picked up the controller for the first time, it's slightly slower and there's less enemies on screen. I think this has a lot to do with the character sprites, larger than the 'X Series' and twice the height of the Nes prequels. It's a beautiful sprite and infused with Inafune character but it is a hindrance on game play, as everything else has to be scaled up accordingly. 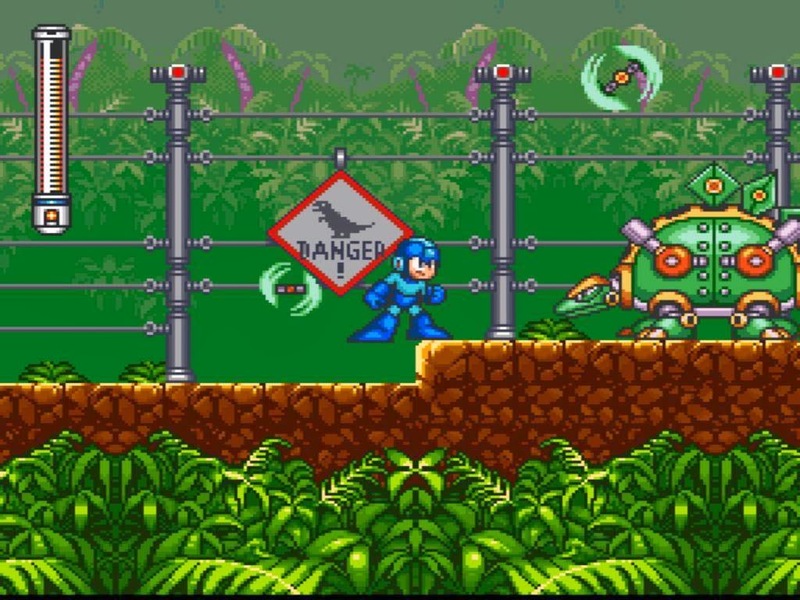 Enemies are larger, bonus pickups are larger and even the bursts fired by Mega Man are larger. It feels like the game has been zoomed in to show case the art assets, without a thought really being given to the fact that this reduces the amount of the environment you see which in turn restricts puzzles and maze elements in level. There's no way to deny that as a game it does look amazing though. Even though some stages may be somewhat lurid in colour choice it's clear from the background elements exactly where you are, with obvious themes running through each. With a slightly lighter, more whimsical tone than the 'X games', there is also scope for parody within ‘Mega Man 7’. Shade Man's stage is a homage to 'Ghouls and Ghosts' (even with the background music playable if the right buttons are pressed) and Slash Man’s level has clearly been inspired by 'Jurassic Park', which would have been in vogue at the time. Perhaps due to the return of so many prominent character designers (the ‘Rock Family Reunion’ as it was known), there is also a celebration of the series' own past with a 'robot museum'. This includes long forgotten foes from the Nes game and the return of Proto Man as a hidden boss. It's these little touches that show that despite a compressed development period, the was still a great deal of care put into 'Mega Man 7' and deliberate extra effort was obviously taken to signpost where upgrades were hidden within the game. As Kaji says “despite the lack of time [designers] managed to be quite picky about the littlest details”. For example, a motor for a lift in Junk Man’s stage stands motionless as without power it can't operate. Firing Cloud Man's thunder bolt electricity based weapon naturally solves this problem, allowing access to the ‘Rush Jet’. It's logical and obvious when you think about it and according to game director Tsuda it is reflective of a conscious design decision. “One of the major concepts for ‘7’ was to create lots of places where the player can have fun with the special weapons”. It was a brilliant idea that makes the exploration aspect of 'Mega Man 7' a whole lot more pleasurable than it has been in other games. There is a lot of bonuses to be found in the game too. However, unlike 'Mega Man X3' it has struck a good balance of offering reward without drowning the player in too many confusing upgrades that can only be used in correct combinations, specific circumstances or when at a certain level. 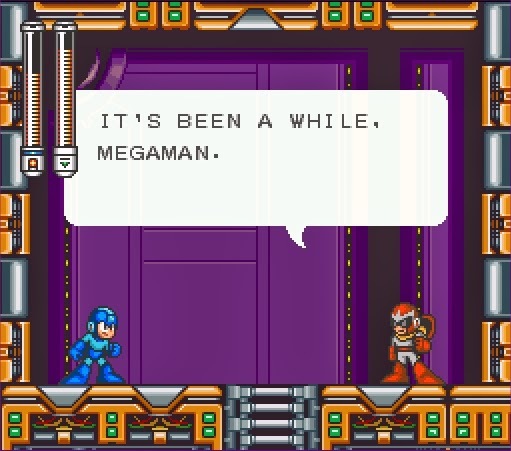 Upgrades in 'Mega Man 7' predominately are 16bit interpretations of the systems that worked in the earlier 8bit games. Your trusty four legged companion 'Rush' is back, and with the 'Rush coil' and 'Rush jet' difficult sections of levels can be made more palatable and hidden sections can be reached. 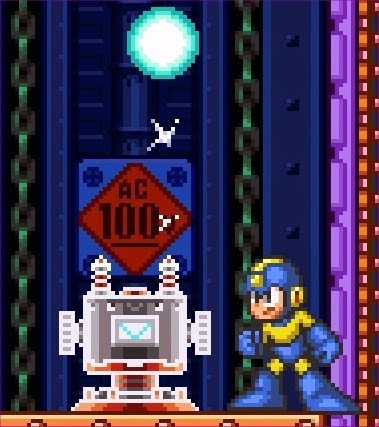 Using these power ups are the only way you can find 4 hidden ‘Rush letter’ plates, which once found allow you to fuse with your pet and become 'Super Mega Man'. Decked out in red and mirroring Zero slightly, your playable character now has the ability to double jump, hover and fire a homing weapon makes all stages significantly easier. In fact I would wager that the bulk of 'Mega Man 7' is actually too easy. Levels are shorter than the X games and pose little worries to anyone well acquainted with 'Blue Bomber'. Yes there are brutally hard sections with one hit kills in unfamiliar territory (such as the fire walls in Turbo Man’s stage) but they are less frequent than other games. For a series infamous for its challenge 'Mega Man 7' feels slightly watered down. 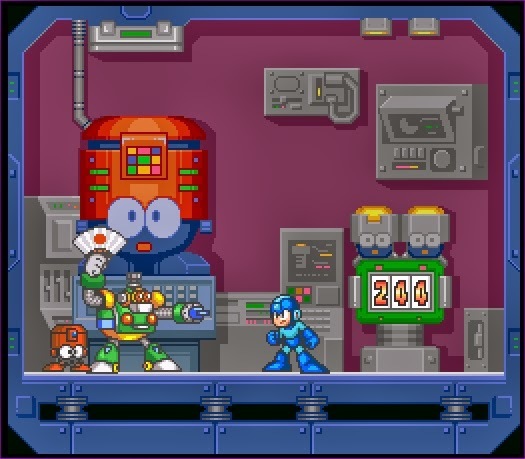 The robot masters are of course near impossible to beat without knowing what their specific weakness is, but once you figure out what it is the end of stage battle becomes as easy as their stage. Being hit by the correct weapon (which of course is one that another robot master has dropped) not only takes off an eighth of their energy but it also resets their attack pattern. They will literally be defenceless if you approach the battle in the correct way. In other 'Mega Man' games discovering which weapon worked best against which end of level boss is part of the fun, but this too is made easier owing to the fact that you can only select from 4 of the 8 stages initially. Once you know which stage has the boss weak to your default weapon you then have a one in three (rather that a one in seven) chance of selecting the correct level to go to next, to utilise the new weapon you've been rewarded against the correct boss. When you've defeated that boss and acquired his weapon, your choice of third stage is fifty, fifty. Only once you have beaten the four initial Robot Masters do the final four appear, but of course now the same problem repeats. In ‘Mega Man 7’ the chance of selecting a stage with a boss you can't defeat has been reduced, and as such the game length has been lessened. Reducing the challenge yet further still is the introduction of "bolts" which are dropped by enemies throughout the game. With these bolts you can visit a shop between levels and not only stock up on lives and energy tanks but also buy any upgrades you may have not found up to that point. It's a nice system that means you don't have to spend hours searching levels for hidden special abilities, but it's also a system that can be easily exploited. In earlier 'Mega Man' games I would use the health dropped from infinitely re-spawning enemies to restore my energy prior to a boss fight. 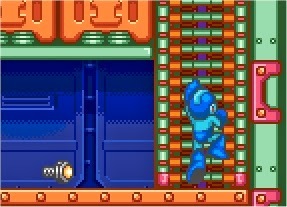 In 'Mega Man 7' this same technique can be used to farm bolts. Within an hour you can quite easily have more than enough in game currency to buy any upgrades you desire, without ever having to look for them in the conventional way. Energy tanks (that completely restore your health) and extra lives used to be rare in the games, but now they literally litter levels and are cheap to buy in the store. This means that if the levels weren't easy enough to start off with, with nine lives and a maximum of four energy tanks the challenge has become to not be successful. 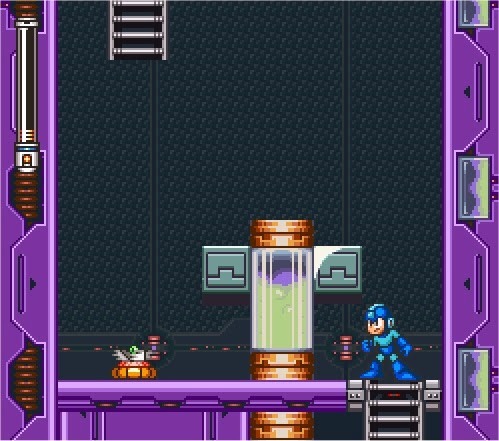 The formally imposing Wily’s castle stages too seem to have become easier owing to various design decisions. Unlike other games, you don’t have to play the levels one after the other in a test of endurance as much as skill. In ‘Mega Man 7’ after each stage you return to the hub world and with almost unlimited bolts by this point in the game you can easily stock up on energy tanks and lives which just make the stages of the final castle, again, too easy. As is tradition on the final stage you must also re-fight all robot masters. However, here after each fight, if you’d die the game doesn’t place you back at the start of the level with all previously defeated foes returned to full health. In other ‘Mega Man’ games the need to defeat all 8 bosses on one life added a huge challenge but it was one that was befitting your upgraded character, especially as you know each foe’s weakness. However in this game should you die on one, all the others that you’ve previously defeated remain defeated. It therefore becomes the same challenge that you’ve faced throughout the game. It’s no longer a case of all your enemies pooling their resources to make one final last ditch attempt to stop you. In ‘Mega Man 7’ being able to retry before each boss makes it simply a series of one on one fights where the odds are stacked in your favour as you’re significantly stronger than when you first faced these guardians. However, one thing literally makes ‘Mega Man 7’ evolve from “easiest Mega Man game so far”, into “the one Mega Man game you won’t be able to finish”; the end of game boss fight with Dr Wily. This is all the fault of one man alone –Inafune. 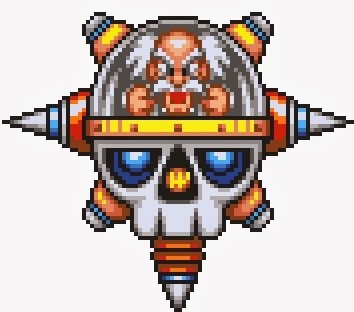 As Tsuda remembers, “The Wily capsule turned out as tough as it did because of Inafune saying ‘let’s make the very last fight insanely hard!’ In the end we created something that cannot be defeated without the use of an Energy Tank”. Tsuda is being optimistic; I struggled to defeat this boss with four energy tanks and a fully upgraded Mega Man. For hours I toiled against him perfecting the timing of jumps to avoid hits that take away half of your energy at a time. Worse still, getting hit by Wily’s weapon freeze you, meaning you are prone to further damage. He has the ability to kill you in an instant, taking away all of your health in seconds, even when he is at the brink of death. Everything about this boss is aimed at making your life hell, from the weak spot that can only be hit with charged weapons, to his erratic unpredictable movement and random firepower. It’s an awful way to end a game, especially one that up until this boss (and one at the end of the previous stage) had been so uncharacteristically easy. 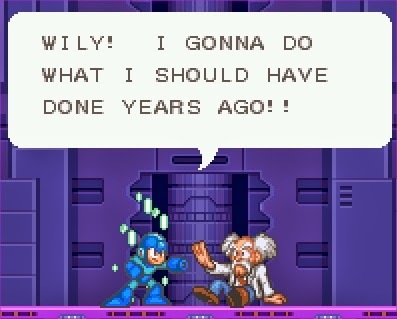 Defeating Wily is a test of patience and luck not skill. You can have a perfect run and die in an avoidable way, which is no one’s idea of fun. In a world where you can easily view the ending on YouTube I wonder how many people will stick with it; as to be honest there was no sense of achievement defeating him, only a huge amount of relief. It saddens me further because when it comes to ‘Mega Man’ I was of the opinion that Inafune really could make no poor choices. Having said this, his involvement in the project enriched the remained of the experience significantly. 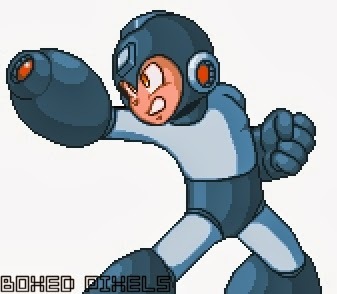 At the time of ‘Mega Man 7’s development Inafune was the lead character designer and not in as significant a position as he was during the development of 'X3'. In spite of this there is much more story in 'Mega Man7' than there was in earlier games in the 'original' series. For the first time there is also an opening cut scene and introduction level, quite a contrast to some Nes games where the entire narrative was told in a few lines of text that top and tailed the game. The tone of the 'original' series was always intended to be more childish, but in some ways this makes any darker narrative ideas even more shocking. If you had to put money on which iteration of Mega Man you'd expect to be happy to carry out an execution you'd choose 'X', not the family friendly happy smiley original Mega Man. The ending scene is as brilliant as it is unexpected (provided you can actually get to it with the insanity of the last boss!) a far cry from where ‘Mega Man 1’ started. 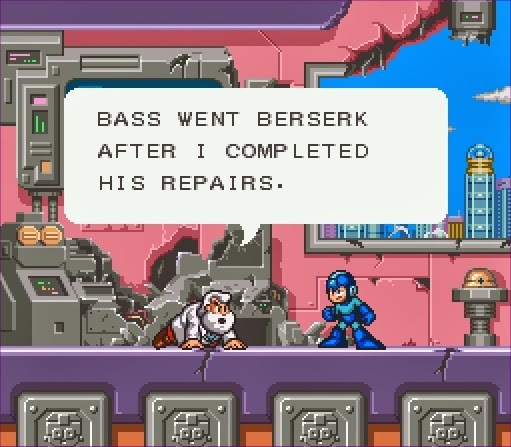 The character of Bass too seems to be included to indulge Inafune’s love of dark conflicted characters. When asked which of his characters he likes best he often suggests 'Zero' but it would have been impossible to include him in 'Mega Man 7' as this game predates his creation by hundreds of years. Instead we have Bass and Treble, shadow versions of Mega Man and Rush. Decked out in evil black armour and willing to betray and lie as his situation dictates, Bass is one of the best inclusions in the game and the few times he appears is tragically infrequent. You have to wonder if he would have played a larger part if the development period had been more generous. But it is perhaps because of the time constraints that 'Mega Man 7' is as pure and focused as it is. My criticism of 'Mega Man X3' essentially boiled down to it just being too much. Too many things to find, levels too large, upgrades too complex, opening boss battle too hard. As a result despite offering less, I'd argue that 'Mega Man 7' is the better game even with its ludicrous end of game Wily battle. Sadly though it can't compete with either ‘X1’ or ‘X2’, unsurprisingly considering how adored these two games are. The music of ‘Mega Man 7’ lacks the variety and scope, the environments lack the vibrancy and scale and the levels are universally less imaginative or creative. As is often the case Super Play’s Tony Mott manages to sum up my own feelings beautifully. “At the end of the day I’d rather play a ‘Mega Man’ game than a licensed game of a similar nature. It’s all working to a tried and tested formula and it delivers tried and tested playability”. It may be the third best ‘Mega Man’ game that you can play on a Super Nintendo, but that means it’s still one of the best games you can play on a Super Nintendo. Sometime you have to ask if people are being too generous. I am always very appreciative when people contact me and say they have enjoyed the blog and want me to try out something just so they can see my opinion of it. This has never been ‘Mountain Dew’ or ‘Doritos’ but it has in the past been a game or two. I never thought anyone would send me something as valuable and expensive as ‘Mega Man 7’ though, especially as they are fully aware of how much it goes for on eBay. I felt guilty accepting it initially, especially as it came with the original box propelling the value further. But after insistence from them reluctantly accepted a game that I know I’d love. I think they know how much I appreciated the generosity, but if not they should now. Who knew writing words about old games on a train would allow me to meet such wonderful people. Sometimes the Retro gaming community really does wow me. Thankyou.